“So what verse should we have engraved on our wedding band?” we pondered a few months before our wedding in 1998. After praying and talking, we turned to John 17:23 and immediately knew this verse was our “marriage verse.” “I in them and you in me. May they be brought to complete unity to let the world know that you sent me and have loved them even as you have loved me.” We wanted God to help us choose a verse that would speak both destiny and legacy into our marriage. During our engagement, we had no idea how God would weave this verse into our lives. However, sixteen years later (wow – has it really been that long?!? ), we sit amazed at how God has used this verse to influence our marriage and ministry. Amazingly, the unity among the Persons of the Trinity (John 10:30) is the same unity Jesus desires among believers (John 17:23) and the same unity He desires between a wife and husband (Matthew 19:4-6). That God would encourage His people to have the unity that resides in the Trinity rocks our world! Chad and I first served together overseas in Albania. As seminary students we traveled there to serve among the Kosovar Albanian refugees for three weeks. Exhausted but exhilarated, we thoroughly enjoyed working with one another on behalf of others. To be honest, I was quite nervous about our first international trip overseas. 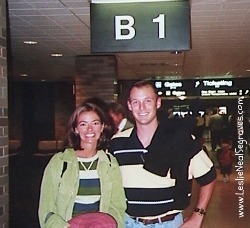 We knew we wanted to serve God overseas long-term, but we had never traveled across the ocean together. What if the other acted “differently” in new and strange environments? Towards the end of the three weeks, we were walking quickly down the street of Tirana. Holding hands, I looked at Chad and said, “Out of all my experiences up to this point serving overseas, I have to say you are my favorite partner I have ever had.” Without slowing down, Chad looked at me, looked ahead again and then with a twinkle in his eyes but a straight face, he said, “Oh, I don’t know. I think I prefer that hairy guy I worked with in the Philippines!” We both burst out laughing. Since that time, God has continued to teach, stretch and mold us (often that part hurts!) and show us that if we reflect unity in both relationship and purpose the world will know Christ. As strategic people who want the world reached, we love that God uses anything and everything of kingdom value to serve as a tool for completing His mission. Be One – to let the world know. You have more than a theme for marriage and ministry in this verse. You are building an eternal legacy. Your words have blessed me today Leslie. Ann, thank you so much for your encouraging words. I so desire to impact eternity for Christ and others. I pray God sustains, protects, and helps me finish well. Only by His grace! Congrats Caryl on 46 years of marriage! I so appreciate the model you have set for others, myself included. I also cannot imagine marriage without Christ as the foundation. It’s hard enough as it is! God truly makes it richer and offers strength!